WICHITA, Kan. (Feb. 28, 2012) – Hawker Beechcraft today received notice that the U.S. Air Force will set aside the contract previously awarded to Sierra Nevada/Embraer for the Afghanistan Light Air Support (LAS) competition, effective March 2, 2012, and reinstate Hawker Beechcraft Defense Company to the competitive range under the procurement. “We commend the Air Force for this decision and we believe strongly it is the right thing for the Air Force, the taxpayers and the people of Hawker Beechcraft,” said Bill Boisture, Chairman, Hawker Beechcraft Corporation. “We look forward to competing for this contract as this important initiative moves forward. The Beechcraft AT-6 is the most capable, affordable, sustainable and interoperable light attack aircraft in the world today. The aircraft has proven that it can accomplish the entire mission spectrum described in the LAS competition and more. 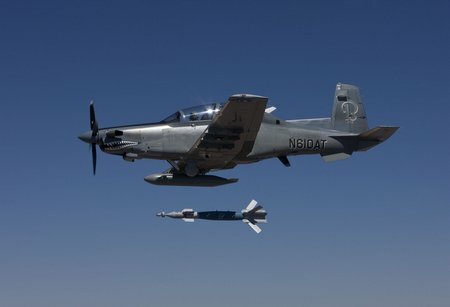 Importantly, the AT-6 has class-leading weapons capabilities including NATO-standard unguided munitions, laser guided bombs and laser guided air-to-ground missiles. Additionally, the AT-6 is the first and only fixed-wing aircraft to have integrated and successfully employed 2.75” laser guided rockets. Hawker Beechcraft is grateful to have the support of its employees, concerned Americans, members of the flying military and policy makers from across the United States. The company will continue to provide appropriate information to those interested at www.missionreadyat6.com, as well as on Facebook at www.facebook.com/MissionReadyAT6. The AT-6 is designed and manufactured in the U.S. to be used by the U.S. and its allies. Keeping this contract in the U.S. will help preserve 1,400 domestic jobs at 181 companies in 39 states. The AT-6 draws its heritage from the airframe of the number-one training aircraft in the world, the Beechcraft T-6. The company has built more than 740 T-6 aircraft, which are used to train every fixed-wing military pilot in the United States and are successfully operated by six allied air forces around the world. The graduation to the AT-6 light attack airplane would be a natural progression. The AT-6 is the sum of the Air Force’s proven T-6, A-10C mission system and MC-12W sensor suite, which offers the Department of Defense logistics and cost efficiencies that no other aircraft in the competition can match. The weapons and avionics systems included on the AT-6 are familiar to NATO allies and have been proven effective on many continents and in other NATO aircraft.